Available on Blu-ray (2-Disc) and DVD (3-Disc) 527 minutes. 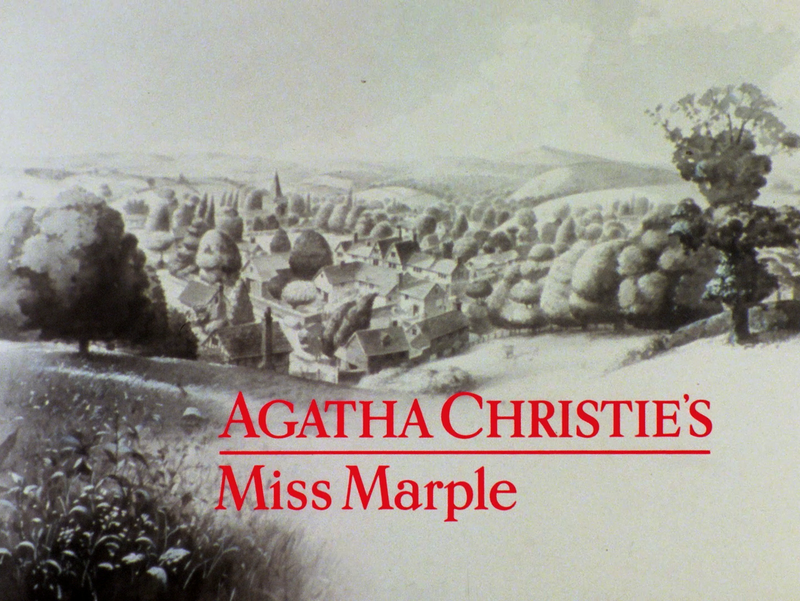 There is something really special about Miss Marple. By that I mean the 1980s television series that was a co-production between the BBC, Network Seven and A&E Networks. I just got done with another review where I lament the passing of the original A&E (Arts & Entertainment Network) years ago. Back in the day for people like us who adore British television, this network was a godsend. I suppose it is now that to people who love reality TV which I am not a part of at all. 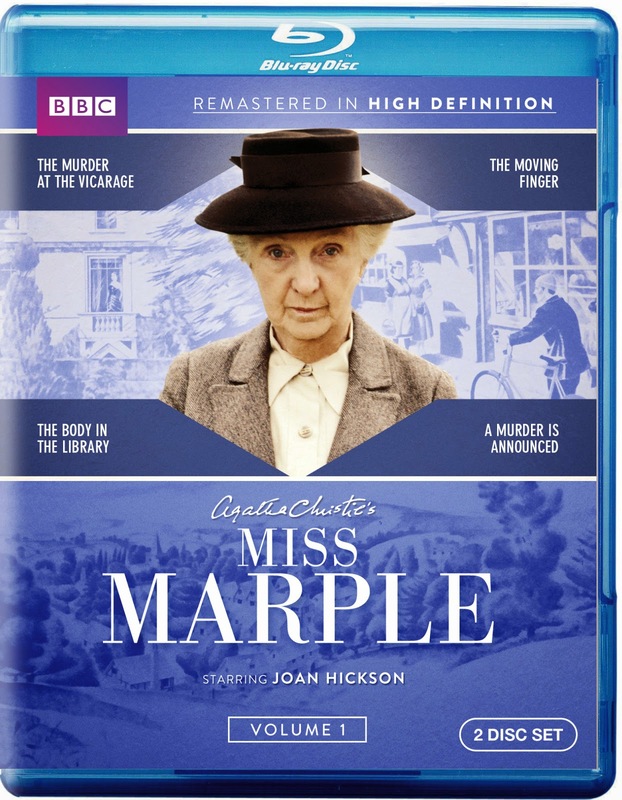 There is something wonderful about a classic series to get a release in any format but it is more of an event when that series is treated to lavish care such as the first volume of the Miss Marple mysteries on Blu-ray and also DVD. I was fortunate enough to be sent the Blu-ray to review and as I posted weeks ago on this site, the image and picture detail are simply amazing. This is one of those occasions as I watch this series and simply cannot believe my eyes and am so fortunate to be watching this beautiful production re-mastered. I tuch more on the restoration later but let’s start literally at the beginning. It will come as no surprise to anyone that Miss Marple was created by Agatha Christie in 1926 in a short story titled The Tuesday Night Club in The Sketch magazine. Her first full novel was The Murder at the Vicarage in 1930. For those who do not now, Miss Marple is an amateur detective who has keen instincts in solving murder. What makes her so wonderful is that she is this elderly lady who is very unassuming which normally gets people to think she is not a factor but is in fact a very intelligent woman. She is often the bane of the police’s existence but very soon they are all trying to get her opinion or help because inevitably, they all know that she is right. Miss Marple novels continued to be published until 1976 with Sleeping Murder. It’s interesting though since Sleeping Murder has a couple of similarities to Poirot’s final novel, Curtain: Poirot’s Last Case. Sleeping Murder was written in 1940 but not published until 1976. In fact, this novel was written posthumously after Christie’s death. The novel published before it was Curtain: Poirot’s Last Case which also was written in the 1940s but held until near her death. She wrote that in the 1940s as she was frightened she may not live through the war but wanted an actual end for her Belgium detective. Over the years, many women had played Miss Marple. There never was a definitive version that Christie really liked. It was when Joan Hickson was in the play Appointment with Death that Agatha Christie sent her a note, "I hope one day you will play my dear Miss Marple.” Although Christie would never see this happen in her lifetime, it did happen which is what we are reviewing today. 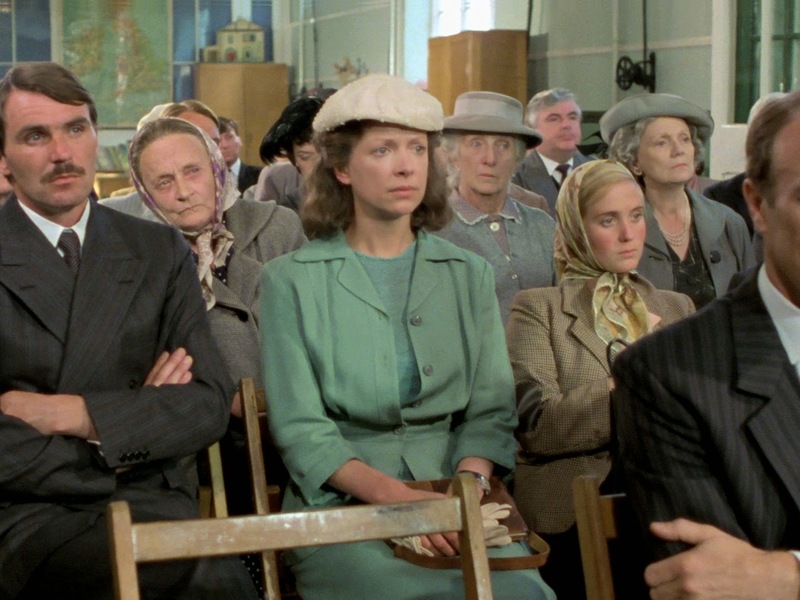 I will admit that I had only started watching anything Miss Marple with the ITV series Agatha Christie’s Marple starring Geraldine McEwan and later Julia McKenzie. I liked that series for a lot of different reasons but I had been wanting to get my hands on this version for some time. I got a hold of the Joan Hickson version on DVD recently and started to watch it. I was amazed by what I saw. 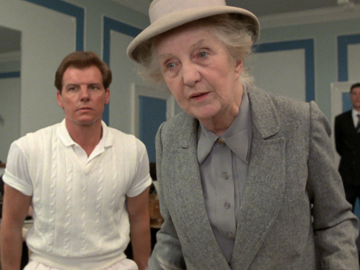 To start with, Joan Hickson was 78 when she took the role of Miss Marple. The thing that struck me as I watched these episodes was that Joan plays the role very vanilla. It sounds like I am being rude to her but actually I think this is quite the compliment. She blends into the background. It is almost easy to forget she is there. Then, suddenly she comes to life but only when she feels the time is right. It’s almost like she is not the star of her own series. She is gracious. She almost plays it like Miss Marple is sure of her instincts and hunches but yet is sometimes a little shy to always speak her mind. She is not overbearing in any way. She is very comforting. Don’t agree or don’t believe me? 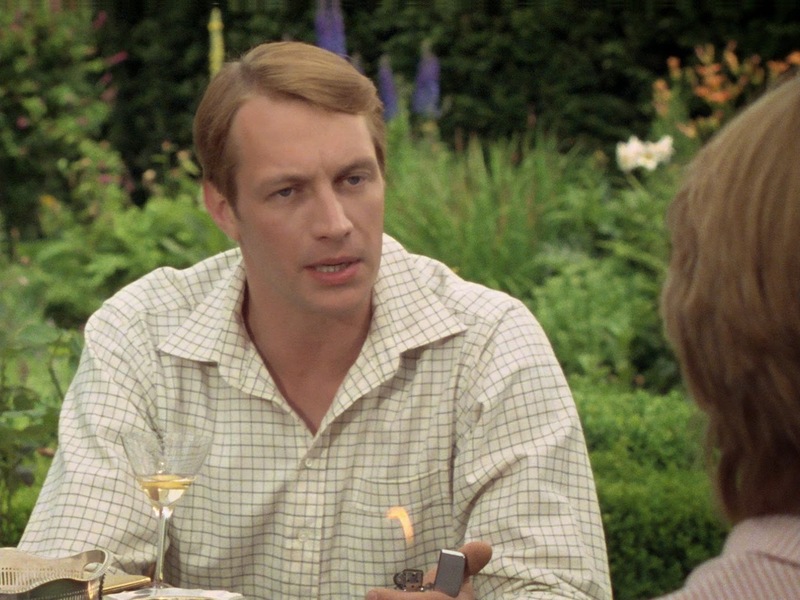 Watch how Hickson plays the role any time someone gives Miss Marple any kind of compliment. She gushes a little in embarrassment as if it is difficult to accept a compliment. I think Joan does a very complex job in this role and I loved every minute of watching her. 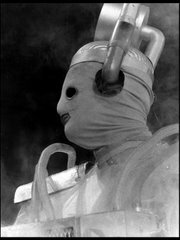 What we get in this first volume (of 3) Blu-ray are the following episodes: The Murder at the Vicarage, The Body in the Library, The Moving Finger, and A Murder is Announced. These episodes make up the first set of episodes aired on the BBC from 1984 to 1986. It appears these episodes are presented in publication order rather than broadcast order and I am not too sure what I think of that. I am pretty much a purist to have series put into the proper broadcast order but I know this will not be a problem for 99% of the Earth’s population. In this case it’s the episodes that count plus I don’t think there are any continuity problems with this. There is a lot of period drama/television being made these days. I would agree that much of this is good. Looking at Downton Abbey takes place roughly around the same period of these episodes or certainly Agatha Christie’s Poirot. I know for example an amazing series like Foyle’s War on many occasions enlisted the help of computer technology to paint out traffic signs on the road or modern street lights. When this iteration of Miss Marple was made, none of that technology was available to help out like it does today. It was real locations, which needed to be converted into the locations of the time. Television is not made this way anymore. This is not me moaning about technology, it is me also moaning about pacing and development. Most of these episodes apart from The Murder at the Vicarage are 2 to 3 episodes in length. Does this always work to the story’s advantage? Usually yes but I will admit that sometimes things take too long to develop just not often. That being said, there are great shots of people riding bicycles on country roads entering villages or people walking against beautiful backgrounds. I feel that this series of Miss Marple is one of the last vestiges of this type of television. Of course, my disclaimer to all of this is that this doesn’t mean I dislike the series I mentioned above, in fact the opposite. It’s just that it is easy to be reminded of this amazing style of BBC television which is kind of a lost art. 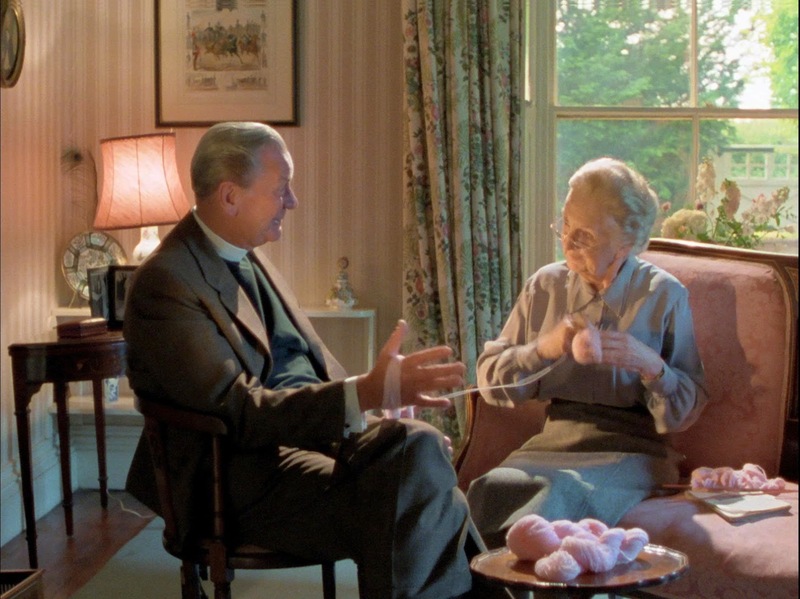 Sometimes, it feels like we don’t get a ton of Miss Marple in the episodes. Most of the time, we are watching an Inspector such as Detective Inspector Slack (David Horovitch) or Detective Inspector Craddock (John Castle) interviewing suspects, trying to figure it out. They run into Miss Marple only for her to tell them something that throws everything out the window. Perhaps my favorite aspect of the series is the opening credits and theme music. It might be one of my favorites in all of British television. The open credits is made up of black & white (later to become color) illustrations of “Agatha Christiesque” stereotypical characters in positions that show us some of the more questionable sides of human kind. Shadowy figures at a church, two women outside a shop talking quietly to each other probably spreading gossip about other people in the village, a woman peering out of a window and, of course, a body. The best part is the theme music that once you hear it, it never leaves you. Ever. It is the type of tune that can be simple, with few instruments or it can also be grand in scale. It features in most of the incidental music. Parts of the theme are incorporated in a ton of the music. It is so cohesive that there is no doubt what you are watching. I would love a full soundtrack of this music. It is superb. As for the episodes on this set. I will be honest, I am not an aficionado of the literary works of Agatha Christie especially where Miss Marple is concerned. I love the stories and characters and I also know that with the ITV series some liberties were taken including adapting some of Agatha Christie’s other work and shoehorning Miss Marple into it. With the BBC Miss Marple series from the 1980s, it is very clear that this is going to be a pretty close adaptation of this classic series. A lot of talented people have worked on this series yet I feel like Joan Hickson wouldn’t have bothered with this series if it wasn’t as true to the original source material as possible. I have no grounding in this information; it is not factual yet I would like to believe this based on no evidence whatsoever. I love all the stories on this set yet a couple really jump out at me. I love The Murder at the Vicarage for a couple of reasons. First of all, you only need to read my reviews on Midsomer Murders to know how much I love mysteries that include religious institutions such as nuns, priests or churches. I am fascinated by that. That being said, if you want a great mystery set in a Nunnery, check out the Armchair Theatre story Quiet as a Nun, it is excellent. Anyway, another reason I adore The Murder at the Vicarage is that Paul Eddington plays the Reverend Leonard Clement. Paul will always have a special place in my heart for his iconic characters in The Good Life and of course, Yes, Minister. The other story that is a great stand out for me is A Murder is Announced. It is such a great premise that Agatha Christie would make uniquely her own are the plot points of someone announcing a murder in the local paper and the local folks actually show up to see if the murder happens. Its tremendous fun. This episode features a very young Samantha Bond, a very little of David Collings but a marvelous performance from Joan Simms. I think Joan Simms was an underrated actress that I think was overshadowed by her role in the Carry On films. She is great in all of those but a performance like this is really solid. She could always do a myriad of different types of characters and it was a joy to see her turn up in this. I felt that The Moving Finger was a bit ploddy. To me, it was one of those stories that I mentioned that felt like it had little of Miss Marple in it. Don’t get me wrong, it wasn’t bad at all, I just was finding myself getting bored by it. As I mentioned above, the highlight for me is the fact that this release has been lovingly restored. If you have read articles on my site for a while, you know how much of an activist I am for this sort of thing. Many of us have been spoiled by the work on the Doctor Who DVDs but I am thrilled to see that it has been extended to other series such as Miss Marple. I can try to explain why I think this looks so good but I feel it is much more important to let the pictures speak for themselves. A restoration like this is almost akin to having cataracts every time I watched this series and one day they were removed. The detail, colors, villages, the greenery in the country are gorgeous. The production looks so fresh and vibrant. To say I am happy would be a complete understatement. A few weeks ago, as a teaser I posted some comparison pics and just a general amount of delicious looking HD screengrabs from this release which can be seen here. Much to my surprise and honor the folks who did the restoration, BBC Studios & Post Production, got in touch with me to let me know they did the restoration and asked if I could put a link to their site in my review. You don’t have to ask me twice! You can visit their sit here where there is more information on the restoration of Miss Marple. The color grading was done by Jonathan Wood and if you follow restoration and coloring of British television, his name should come as no surprise. He has done a lot of work on Doctor Who releases and others with his team such as The Sweeney, The Professionals, House of Cards, The Persuaders, The Goodies, and Space: 1999 among others. The thing about the restoration is that it allows us to see these episodes the way the creators intended them to be seen. I think it is very easy (if not ignorant) to accept the film we see from a BBC production prior to going back to any source material as the way it was intended to be seen. I don’t mean just Miss Marple but think about anything you have seen from the BBC that had either film inserts or even full episodes on film. Prior to any sort of re-mastering, most of the film looks flat with colors crushed; almost like the productions were going through the motions of getting the shots in the can. The re-transferred film inserts from the 1980s Doctor Who episodes shows us how much work went into creating these shots but were lost due to poor telecine technology at the time the programs were originally made. I should have made this connection before but Miss Marple, as she often does, showed me the way. Watching the un-remastered SD versions of the DVDs before this Blu-ray came out, they just look like television shot on film; nothing remarkable about it. Re-mastered though, there are great treasures for us to discover in each episode. We see how blue Miss Marple’s eyes are and we see the depth of shadow and color in every scene. Just watch the opening of The Murder at the Vicarage. Even in the opening when Paul Eddington’s character is walking through the interior of the church. There are wonderful shadows and even more with the light shining through the stain-glass windows on him as he is walking in the church. It is beautiful. As a geek of British television and restoration, I just want to say thank you for the work that has gone into this release. There is one interesting extra in this set. It’s called A Very British Murder: Part One The New Taste for Blood. 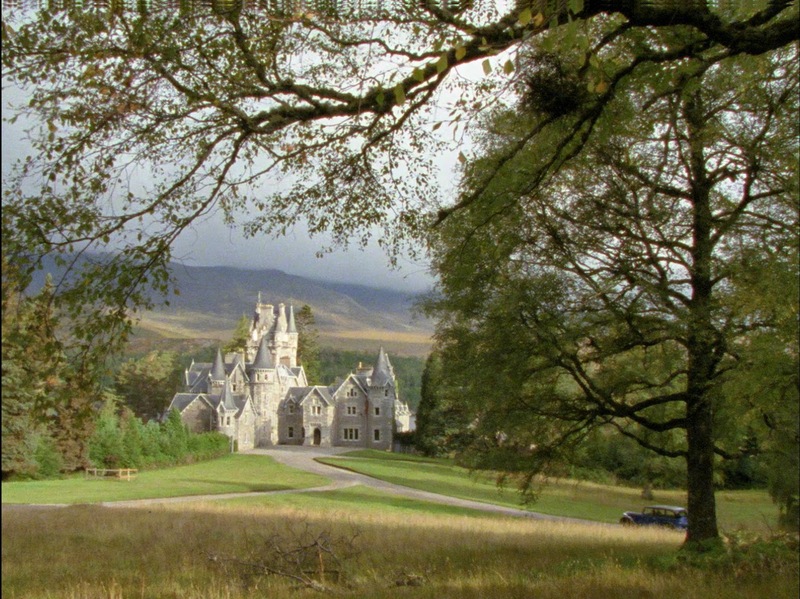 It’s a 3 part series that originally aired on BBC Four in 2013 and is presented by Dr. Lucy Worsley. I have to admit that when I started to watch it, I didn’t think it was going to be any good. I was wrong. It is actually quite good and informative. It’s a series that chronicles how murder became popularized in the UK by the media and this first episode examines this from the 1800’s before the Metropolitan Police formed and what this affect had on the people of London. Murder that happened during this period spawned songs and plays based on the real murders that took place. This was the start of what we would eventually read in books and watch on TV and film. Dr. Worsley is very interesting as she not only presents but has a massive hand in telling the story. A very surprising extra and I am looking forward to the other two installments. Disc 2: The Moving Finger (2 episodes), A Murder is Announced (3 episodes), Extra: A Very British Murder Part One. If you have not seen this series in a while or you have been waiting to pick it up, now is the time to do so. This is the perfect combination between amazing story telling and beautiful visuals. If you feel like you have seen enough of the series with the 21st century episodes, do yourself a favor and check these out. I love different variations to beloved characters but some are the definitive versions for me. Joan Hickson as Miss Marple is the definitive version and should not be missed. This Blu-ray set is Highly Recommended. Next Review: Why stop with the Agatha Christie series? 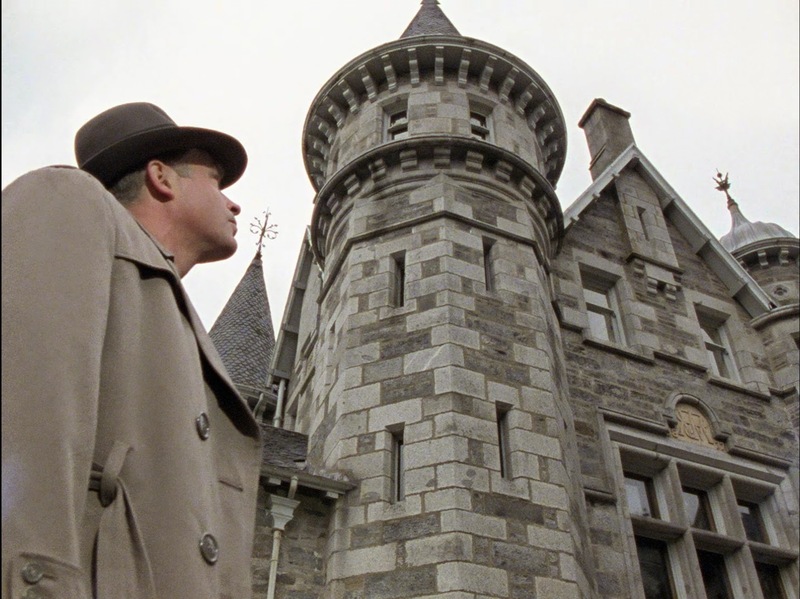 We say farewell to my favorite, the wonderful Hercule Poirot in my review of the Series 13 Blu-ray set from Acorn Media. Next week: We haven’t had an article about a randomly chosen TV series in a while. After all, that is why this site exists! We will be taking a fond look back at Series 1 of the wonder comedy Butterflies!